The following is a summary from the USDA regarding the death of Bunny the elephant at Tennessee Elephant Sanctuary and the USDA’s subsequent clearing of TES of any wrong doing, judge for yourself. On May 14, 2009, an elephant named Bunny died at The Elephant Sanctuary (TES), located in Hohenwald, Tennessee. Bunny was a fifty-seven year old, female, Asian elephant that arrived at TES in September of 1999. Bunny had a long history of foot problems prior to arriving at TES which subsided during her stay at TES. Her foot problems and the discovery of arthritis in her hind hip during her necropsy may have contributed to her downfall. Bunny went down on May 2, 2009 recovered even when she was hoisted to her feet with a back hoe. –(name redacted)–(name redacted) and the staff at TES continually discussed the option of euthanasia but decided against it as in their opinion the elephant was not suffering due to the pain medications she was receiving. Bunny was kept from exposure of the elements by stretching a tarp above her and covering her with blankets when necessary. The necropsy on Bunny was led by. University of Georgia, Veterinarian, (name redacted) who stated that she would not be able to give me any kind of statement until the cultures were finished incubating, and the dean and general counsel of the university approved her statement. I do not expect her statement until January of 2010. 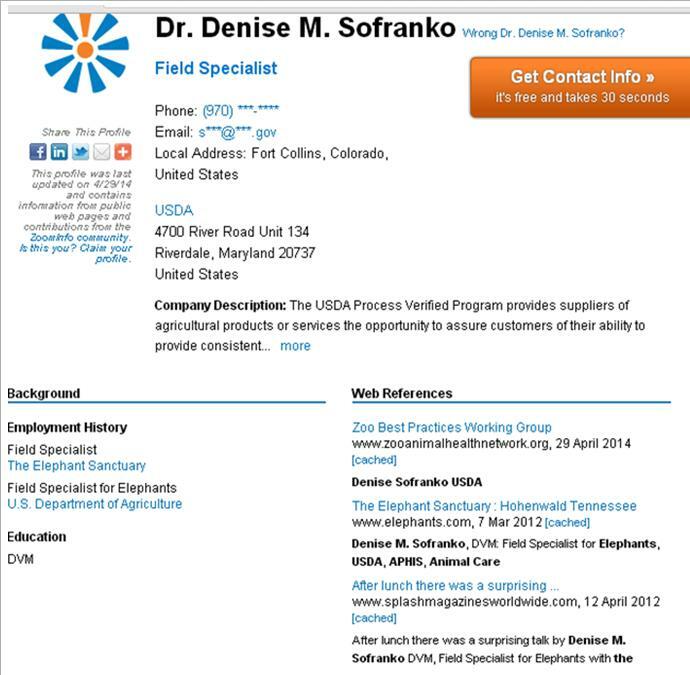 Check out this little gem pulled off the net a few years ago where Sofranko cites work as a veterinarian at TES on her resume. 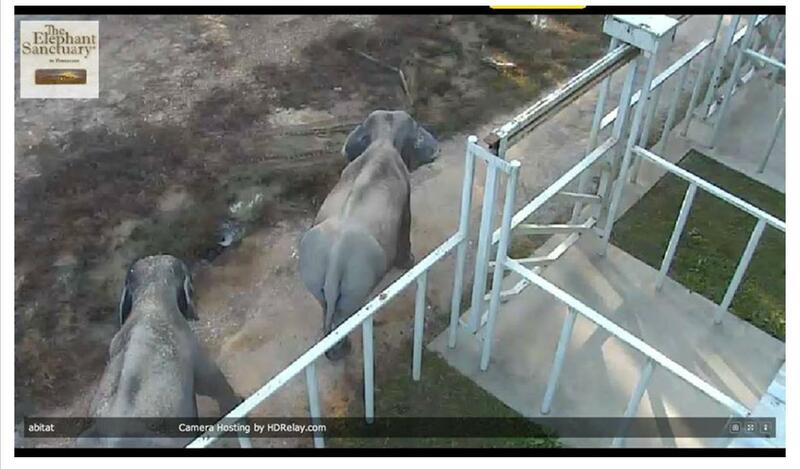 Perhaps Dr. Sofranko can explain what is happening to these elephants at TES? How can this NOT be a CONFLICT OF INTEREST? She worked there and now she is allowed to write up inspection reports? Do you really think she is reporting fairly, honestly and without without bias? If you answered yes I sincerely hope you enjoy taking your Unicorn for a walk this evening because you are either a naive child or a crazy person. A Freedom of Information request was made last year to the USDA inquiring about any tuberculosis at the facility. The report came back with zero information about TB. That was odd considering we all know there are elephants with TB there. 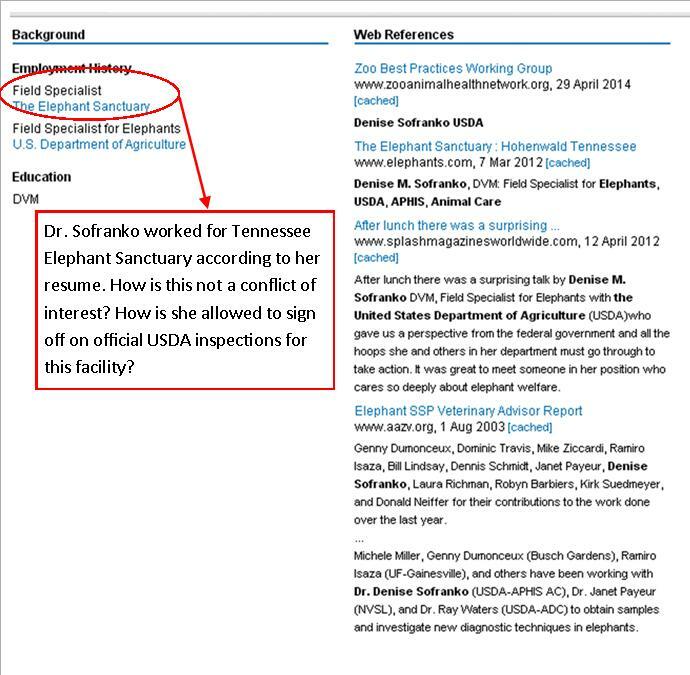 Just a few months after that FOI response the sanctuary announced a case of tuberculosis in one of their elephants, funny how the USDA FOI request mentioned nothing about TB. In a final note a little shout out to Bob Barker, Mind your own backyard buddy. While you are sending letters to Seattle City Council promoting your private zoo at PAWS and sanctuaries like TES citing in your non expert opinions alleged unhappy and unhealthy elephants in zoos like Woodland Park, why the hell dont you do something about this at TES? Or Thika at PAWS living alone and away from her family herd? Or Annie likely dying from TB at PAWS? You sir are the greatest hypocrite of all. By zoosmatter in animal abuse, animal rights, animal welfare, dead elephants, hypocrite, IN defence of animals, inhumane, politics, sanctuary, tuberculosis on November 5, 2014 .